Welcome your students to the new year with this FREE January vocabulary builder with a related graphic organizer for writing. Begin with RHYMING IN THE NEW YEAR, a fun anagram activity focusing on words that rhyme with NEW and YEAR. A companion graphic organizer for writing, THREE YEARS, provides the basis for a composition about a favorite year from the past, the present, and a much-anticipated year from the future. Next, JANUARY ANALOGIES provides a thinking-skills challenge with thirty items to complete. 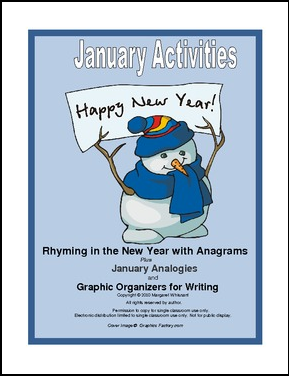 Top off this activity with JANUARY: ONE COOL MONTH, a graphic organizer for writing. Full answer keys are included. Eight total pages.